Day 1 Flight day from your country to Europe, for most an overnight flight. Check into the local airport hotel “The Fast Hotel” to recover from jet lag. Day 2 Pick up from the Fast Hotel at 11AM. Day 3 We travel to the magical area of The Gorge De Galamus and Hermitage De Galamus. Enjoy an easy stroll along this beautiful gorge looking down two to three hundred feet cliffs into the rugged limestone rock streams. Day 4 We will take a short drive through the Pyrenees foothills to “The Cave of Mary Magdalene” where legend says she lived and did healings. What is more obvious about these caves are they are ancient, it is hard to tell whether they are natural or made by others, maybe an ancient people. These three caves each have their own distinct presence. The most popular appears to be a cave where ancient rituals of fertility were likely preformed. It has the most divine feminine presence. A tour favorite. Day 6 We will drive about an hour in the direction of the coast to the desert area to visit Cave of Perillos, we will spend the morning there meditating in this well lit cave. I suspect this was a place of worship or pilgrimage for the Cathar people. Author Lars Muhl believes Mary Magdalene did forty day prayer vigils here. Nearby the caves is Chateau de Perillos, perched on an hilltop over looking the Mediterranean Ocean, some believe Jesus was buried here and we will go to this hidden burial site. Later we will travel a winding country road to visit a mountain peak fortress of Chateau De Payrepertuse. This well built fortress is a great example of the chateaus of France established in the dark ages. Within the structures are two churches, one of Church of Marie and the other a hill top church. Both churches still embody special powers. Day 7 A day of visiting churches and castles all north of Quillan in the towns of Limoux, Carrcasone and Vals. On the outskirts of Limoux there is the famous Notre Dame De Marcielle; a locally famous church with a holy well of higher vibration and a black madonna mysteriously found in a nearby field where the church was built in the eighth century. Outside the town of Carcassonne is La Cite, the largest castle or fortress in Europe. It is a bit of of tourist place but we will split up as a group to visit the fortress, have lunch and possibly visit the Cathedral there. Day 8 In the morning we go to Mt. Cardou, the sister mountain of Pic De Bugarach. A much easier walk but still long, 4 miles total. The top has the strongest presence of Mary Magdalene of anywhere on the tour. Day 9 We go into the Pyrenees mountains to visit the town of Tarrascon home of Chapelle de Notre Dame Sabarts, founded over twelve hundred years ago by King Charlemagne who had an encounter with Mother Mary at this spot. This church is an amazing connection to the feminine. Next we visit a sacred cave of the Cathars, Grotte De Bethlehem, this is a highly charged cave tapping into deep sources of the inner light of the earth.It is easy to understand why this was a pilgrimage site for the Cathars. On our way home we will stop by a country church called Notre Dame De Celles, Mother Mary appeared here to a young man and blessed the local spring in a forested hillside, much like the story of Bernadette in Lourdes. The church has a profound presence of Mother Mary and holy water is available for all, bring your bottles. Day 10 We visit the small church in Bugarach, spirit definitely lives in this quiet church. No trip is not complete without meditation time at the base of the sacred, stargate mountain, Pic De Bugarach. If time permitting we drive into the Communal Forest next to Bugarach to an ancient Celtic Stone Circle with an amazing tree as the head presence of the circle. Alet Le Bains and St Salyvre. Visit an old Roman church in this small town, home of Nostradamus and visit the angel art gallery (good place for souvenirs). Up a narrow winding hill is the tiny village of St Salyvre. A former Roman church, now Catholic. French stories say Jesus died and was buried here. This is an amazing place as it is located at a mountain pass of around 2,000 feet so the views are good. Placing your hands on the alter activates a very powerful energy in the crown chakra and third eye. Day 11 We take a quick trip to the Besu, a old mountain Templar mountain fortress, the view is incredible as we can say goodbye to the area from this strategic point. We pick up our bags and depart for the Fast Hotel in Toulouse for flying out. Road trip day, down south to the Mediterranean coastline of the small port town of Colliure. Spend the morning and part of the afternoon eating lunch in a variety of cafes and enjoying the atmosphere of a the blue sea waters. Hermitage De Galamus, Gorge De Galamus, Take a mile walk along a canyon roadway in the gorge to The Hermitage De Galamus. Scenic splendor completed by a church built in the 4th century in a cave by Saint Antone. However, many feel the cave was used centuries before Antone’s hermit establishment. Hermitage is an extremely heart awakening church and it is suspected to be a place Mary Magdalene may have stayed. Feel her presence with a definite strong immersion into the divine feminine. Cubieries Sur Cin Noble Templar oriented church and site of a grand old abbey. Chateau De Payrepertuse, a beautiful Cathar Chateau high on a mountain top (one/third kilometer up) with a wonderful chapel of Mary Magdalene and a second chapel connecting to spirits of creator and heaven. Meditate in the lower level connecting to the lower chakras and earth then activate the crown chakra to spirits of heaven and sky at the top tower. The castle has remained much intact built on a mountain top. Payrepertuse is a wonderful place to experience a large, ancient castle with much of the original stonework. Enjoy viewing a 360 degree panorama of the beautiful French countryside. Rennes Le Chateau, world famous, the setting in the last scene of the book “Da Vinci Code”. This significant historic site is a most beautiful small chapel in a small community overlooking the small town of Couisa. 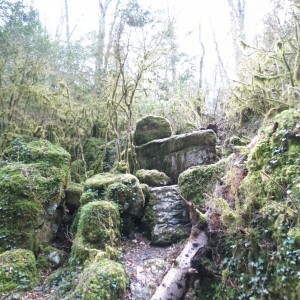 The lay lines of Pic De Bugarach have a direct connection to Rennes Le Chateau and has been revered as a sacred place of worship for more than 2,000 years. Pic De Bugarach, one of the twelve major vortexes or stargates on the planet. We will meditate at the base of De Pic. The Pic has multitudes of ley lines coming out of its base and connecting its energy to a variety of the sacred sites in the area. Bugarach Church, humble church in honoring Mother Mary in the nearby town of Bugarach and highly energized by the stargate mountain, Pic De Bugarach. Celtic Stone Circle of Bugarach, there is something magical about this place, not a well developed stone circle but is a sweet natural energy. Is located in the beautiful Communal Forest near Bugarach. Mount Cardou, legendary feminine counterpart to Pic De Bugarach where Mary Magdalene lead rituals and some say was buried there. Enjoy the subtle energies of this powerful place and feel the presence of Mary. Rennes Le Bain, spend time in this quaint small, Roman town. Sit on “The Seat Of Isis”, enjoy a hot mineral bath in the River Sals, and drink water from “The Source” a high mineral content spring. Fountain De Amour, near Rennes Le Bain, sacred pool where legend says was Mary Magdalene’s preferred baptismal spot. Highly energetic in a fairy like setting. A favorite swimming spot for locals who enjoy the cold, salty waters. Alet Le Bain, Roman town with, most likely, the oldest temple in the area, dedicated to Dianna The Hunter. Also nearby is a wonderful public water fountain of very high vibrational water. Nearby is St Salyvre, a Roman turned Christian church, legend says Jesus died and was buried there. St Salvyre Old Roman site and then church where rumoured where Jesus died. Very Profound place. Notre Dame De Marcielle Home of Black Madonna of Limoux, discovered in the 8th century. It is a beautifully ornate, cathedral and healing springs. St Polycarpe Visogoth church near Limoux with the area’s only aqueduct. Vals Ancient site of worship dating back to possibly 2500 BC, amazing architecture and amazingly powerful. Church is built into mountain side. De Bezu, a Templar Fortress, where legend says held ancient artifact treasures from Jesus via Jerusalem (never to be recovered when the Templars fell). There seems to be an energetic connection between Jerusalem, The Pic De Bugarach and The Bezu. The Caves Of Mary Magdalene, are three caves, legend says was one of Mary’s residences in her nomadic life. However, these caves appear to be much older sacred places of worship for cleansing of human limitations and for the creation of our dreams. Each cave has special properties with masculine and feminine qualities with the third cave connecting to a higher dimensional consciousness. A great location to have an individual awakening as each cave can be in a strong environment to have a profound experience. Plant your seeds of manifestation and transformation as pagan residents did hundreds to thousands of years ago. Perillos, A chateau where legend say Jesus was re-buried. Cave Of Perillos An ancient cave thought to be where Cathars worshipped. Possible sabbatical sight for Mary Magdalene. Grotte De Bethlehem Sacred caves of the Cathars near Ussat and Tarrascon. Chapelle de Notre Dame Sabarts Very old church saluting the black madonnas of the area with photographs and a ornately beautiful black madonna as well. There are wonderful shrines dedicated to Mary Magdalene and Saint Anne. Founded by King Charlemagne in 7th century who saw Mother Mary at this site in which he proclaimed a church to be built in her honor. Notre Dame De Celles Location of Mother Mary citing in 1600’s, very pure energy of Mary and spring water blessed by Mary are of a very high vibration. Monsequr, Cathar Chateau of the tragic deaths of 200 Cathars, included on the admission ticket is a free pass to Monsequr museum. Some believe Monsegur is one of the great pilgrimage destinations due to the power of the mountain the chateau sits on. Two major ley lines cross at Monsegur, energizing the mountain. Yes! I want to sign up for the 2nd tour, from June 3-June 10!